In 2016 best friends Todd Gregory and Scott Billings were looking for an investment. One was retiring, and the other was tired of the hectic Dallas commute and corporate life. They wanted a change. They wanted something unique, something that embodied who they are. They found it in a small distillery producing a one of a kind vodka, by the name of Black Eye Vodka. Most vodkas distilllers use a primarily corn-based mash followed closely by wheat, potatoes, or grapes. Black Eyed Vodka’s main ingredient is black-eyed peas with a small mixture of non-GMO corn. Corn is the most efficient product when it comes to converting starch into sugar, but it is the peas that give it a smooth, gentle texture with a genuinely unique mild flavor. My first taste of Black Eyed Vodka I had just the smallest hint of anise on the tip of my tongue, almost effervescent. Todd said that everyone tastes something a bit different, which is part of the beauty and the allure of Black Eyed Vodka. With a background and childhood history of growing up in the farming community of Texas, Todd insists on using pure ingredients directly from Texas farmers. The peas are from various farmers north of Lubbock in the Texas Panhandle and milled by a fourth-generation Texas family. A family run farm also supplies the vodka distillers with milled non-GMO corn. Because both peas and corn are gluten-free, the result is a 100% non-GMO gluten-free Texas sourced vodka. Grain-to-glass is when a distiller completes the entire distilling process in-house with products purchased directly from local farmers. The grain-to-glass process is a relatively new concept in Texas. Black Eyed Distilling is one of a handful of vodka distillers in Texas that are truly a grain-to-glass vodka distillers. Most distilleries purchase clear neutral grain spirits from an ethanol factory. Once it is delivered to the distillery the ethanol is proofed with purified water and bottled. They do not actually create or distill the vodka. Black Eyed Vodka is created entirely from start to finish on-premise next to the tasting room. The magic happens when Todd and Scott build their own mash (a mixture of the black-eyed pea and corn flours) and cook it with the enzymes. It is the cooking process that pulls the starch out of the grains and turns it into sugar. The yeast is added to the sugar causing the fermentation to start creating alcohol. Black Eyed Distilling takes artisan distilling and grain-to-glass to a higher level by implementing a complete ‘aggicircle’. Once the grain is cooked and the mash is removed, it is sold to another local farmer who in turn feeds the high protein mash to their cattle. This final step completes the aggicircle keeping the entire process local. Black Eyed Distilling embodies the meaning of being an artisan distiller. From their carefully crafted small batches to their distinctive labels featuring a local artist’s original painting in black, white, and gold Black Eyed Distilling. Todd and Scott want to help promote and celebrate local artisans, so while the label colors will always be black, white, and gold the label art and artist will change every 20-thousand bottles. Todd proudly says, “we do all our own fermentation, distilling, and bottling. We have our own reverse osmosis plant that we use to proof the vodka. We distill it (the vodka) 22 times in a 25’ column still using hot copper plates.” He explained the process to me saying that the first distilling run pulls the alcohol from the mash. The second run, which is called the high proof run, refines the taste. It is during the high-proof run that the alcohol hits the hot 20 copper plates making the vodka distilled 22 times. Todd told me that most distillers distill their alcohol only four to 10 times. The more distilled the vodka is, the smoother and purer the flavor is. This is what makes Black Eyed Vodka a premium sipping vodka and well as a great base for craft cocktails. To a non-distiller that sounds like the name of a childhood game, I used to play. He informed me that the heads contain the buildup of all the harsh ethenals and chemicals. Everyone typically throws the heads away, but how much is true the question. The tails are what is at the end of the process. Tails create a bitter flavor. Some distillers will continue to work the tails until they cannot capture any more alcohol. Todd says the problem with this is that when charcoal filters are used to remove the bitterness it also adds the hot burn that so many people associate with straight nonflavored vodka. Each time that the vodka is run through a charcoal filter a bit of the character is removed, and it starts to taste like rubbing alcohol. Black Eyed Distilling is housed in one of Fort Worth’s historic landmark buildings, a 107-year old firehouse built in 1911. The firehouse still holds some of the remnants and charm of days gone by with the original fireman’s hole that the fire crew would race down to get to the trucks. I asked Todd what is in store for Black Eyed’s future. He said, “We are growing fast. Everyone who tries our vodka loves it. We have more people who tell us that they are not vodka drinkers or that they cannot drink vodka straight. I tell them just to try it, and they are so amazed when they do.” Todd went on to say that even though they like the charm and history of the firehouse, they are looking to expand to a new building in the next 18 months or so. If you are in the DFW area of Texas stop by the tasting room at 503 Bryan Avenue in Fort Worth, the tasting room is open Fridays 5 – 9 p.m. and Saturdays 2 – 9 p.m. Tours of the distillery are available Saturdays at 4 pm or by individual appointment. 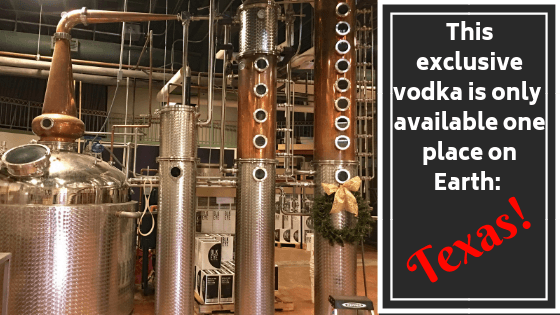 To arrange a tour call 817-349-9977 or visit their website at http://www.blackeyed.vodka/.